Is Ceramic Non-Stick Cookware Safe for Healthy Cooking? What kind of cookware do you use at the moment? As we know, there are several types of cookware that most homeowners have been using. 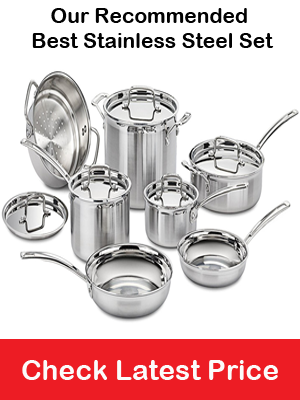 Those are cast iron, Aluminum, Teflon, stainless steel, and much more. Now we will specifically discuss about one kind of them, and that is ceramic cookware. Ever since its first production, most people start to love using it. But, there are some people still questioning about its safety. So, is ceramic non–stick cookware safe, indeed, to use for cooking? To answer that, let’s learn more about this product. 1 What Is Ceramic Non-Stick Cookware? 1.1 Is It Free from Toxic? 1.2 Why Should We Use It? 1.3 Is There Anything Else to Concern? 1.4 So, Is Ceramic Non-Stick Cookware Safe? What Is Ceramic Non-Stick Cookware? It is important to know that there are two types of ceramic cookware. The first one is 100% ceramic cookware. As you can see from the name, it is a cookware whose body is entirely from ceramic. The materials used for this product are a mixture of water and clay. It is totally different from the second type, ceramic-coated cookware. The body of the cookware is actually of metal. The surface uses a layer of ceramic to cover the metal body. Both of these types use special glazes to cover the surface. The glaze on 100% ceramic cookware aims to enhance the strength and prevent moisture from getting into the cookware. On the other hand, the glaze used on ceramic-coated cookware has a function as a non-stick coating. It prevents the food you are cooking from sticking to the surface. From the brief explanation above, we can see how different both types of ceramic cookware. If what you need is the non-stick one, make sure that you choose ceramic-coated cookware, not the 100% one. Is It Free from Toxic? Now we will talk about the main concern of using ceramic non-stick cookware. Some people are still in doubt with the non-stick glaze. They are afraid if the coating contains hazardous chemicals. If this is the issue that pops out in your mind, do not worry then. The non-stick coating used on ceramic cookware is completely free from toxic. The materials of the coating are from inorganic minerals, including oxygen and silicon. The inorganic term here refers to not containing carbon. Hence, you can be sure that this cookware is very eco-friendly. Furthermore, we can see that there is no chemical used in the coating at all. It does not contain PFOA, and PTFE like you can find in Teflon. The use of these chemicals is also for non-stick function. But, since they contain fluorine, they can be very dangerous to our health. Long-term expose of these chemicals may lead damages to your heart, liver, thyroid, and immune system. Although it has no such chemical substances, there is another issue of the coating that people concern with. It turns out that the porcelain glazes on some ceramic cookware contain a small amount of lead. Although we say it small, it still has a potential to harm our body from the inside. Lead poisoning can cause several health problems like abdominal pain, memory loss, loss of appetite, etc. Please keep in mind that not all ceramic cookware contain this chemical element. In order to prevent lead exposure, you can check the detail of the product carefully. Make sure that it has been tested for lead content. Now we already know that ceramic cookware uses inorganic materials. It does not involve any chemical used at all. About the lead, we can simply check out the information. Besides these factors, there are still some others which may interest you to use it. The first one is the non-stick feature again. The purpose of the coating is not only allowing you to cook without any sticking problems. But, it also enables you to wash it easily. You can do it by wiping it with a wet cloth or sponge and mild detergent. For better result, you can soak it in hot water before washing it. The second one is the functionality. Apparently, we use this cookware for cooking preparation. But, it also has other function. You can use it as a food container whenever you have too many leftovers to store. Some companies manufacture their ceramic cookware complete with a lid. This allows you to have a better and more properly stored food. Last but not least, this product comes with such a great price regardless of its convenient features. Some cookware are even on sale with the price set below $100. For maximum usage, it is better to go with the one above $100. Is There Anything Else to Concern? There is one thing that people complain the most about ceramic cookware. That is the durability. Although this product is sturdy, it is not as durable as you thought, especially the coating. In some cases, it actually performs really well over the years. But, for some people, it does not last long in spite of their careful maintenance. However, you might not meet with such problem anymore with the latest cookware. It is because some manufacturers now add more layers of ceramic to improve the coating. That addition will make it more durable. Here are several things you can do to extend the lifespan of its coating even more. So, Is Ceramic Non-Stick Cookware Safe? Yes, Ceramic Non-Stick Cookware is completely safe for healthy cooking as they doesn’t contain any harmful chemicals like PTFE and PFOA. Also, the nonstick coating does not react to food while cooking. The cookware never leaches any materials (like sol-gel, silicon or inorganic mineral) with food that is harmful to the human body. Thanks Ellen for the informative post.